Old school Bollywood poster of the hit Hindi film Asli-Naqli (1962) for sale. 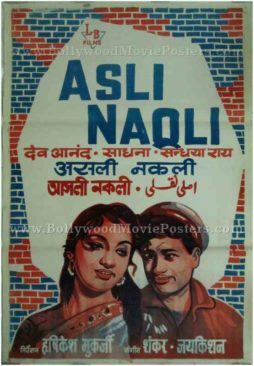 Featured here is a rare surviving old Bollywood poster for sale of the black and white Hindi movie Asli-Naqli. Directed by Hrishikesh Mukherjee, the film starred Dev Anand, Sadhana Shivdasani and Sandhya Roy in pivotal roles. Printed and circulated several years after the first release of the film (somewhere in the 1980s), this old school Bollywood poster was originally designed for publicity of the film but never ended up being used. Asli Naqli was one of the early successes of noted film director Hrishikesh Mukherjee, making this old Bollywood poster highly collectible! Dev Anand is seen prominently in the poster wearing his trademark cap in a very quirky hand drawn avatar. Sadhana appears alongside in an equally quirky hand drawn portrait. This old school Bollywood poster features a slogan at the bottom that reads, “Old is Gold” to capitalize on screening the black and white film in an era of color films. The use of bright yellow and red colors gives this old school Bollywood poster a stunning visual appearance. Asli Naqli is fondly remembered for its amazing soundtrack composed by Shankar Jaikishan. A song from the film “Tera Mera Pyar Amar” sung by Lata Mangeshkar is played till today. 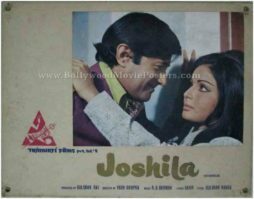 Old Bollywood still photo set of the Hindi film, Joshila (1973) for sale. This is an actual surviving set of eight old Bollywood lobby cards of the 1973 Hindi film that starred the evergreen star of Bollywood, Dev Anand in the lead role along with dream girl Hema Malini and actress Raakhee. Printed and circulated during the original first release of the film (early 1970s), this set of eight Dev Anand old photo stills was designed and printed to be used for publicity of the film inside a cinema hall as lobby card display. These old Dev Anand photo stills were printed and issued to a cinema hall that actually screened the film but never ended up being used. Directed by Yash Chopra, Joshila was a Bollywood thriller that starred Dev Anand, Raakhee and Hema Malini in prominent roles. Dev Anand is considered one of the greatest actors in Indian cinema, with a career spanning over 65 years during which he appeared in over 100 films as lead actor. Classic hand drawn movie poster of the hit Hindi film Asli-Naqli (1962) for sale. Featured here for sale is a rare surviving old hand drawn movie poster of Asli-Naqli. Directed by Hrishikesh Mukherjee, the film starred Dev Anand, Sadhana Shivdasani and Sandhya Roy in pivotal roles. Printed and circulated a few years after the first release of the film (somewhere in the 1960s), this classic hand drawn movie poster was originally designed for publicity of the film but never ended up being used. Asli Naqli was one of the early successes of noted film director Hrishikesh Mukherjee, making this classic hand drawn movie poster highly collectible! This hand drawn Bollywood poster was originally designed in oil on canvas format by a small time art studio in Kolkata, giving it a very quirky appearance. Dev Anand is seen prominently in the poster wearing his trademark cap in a very quirky hand drawn avatar. Sadhana appears alongside in an equally quirky hand drawn portrait. The entire hand drawn movie poster is set against a brick wall background. 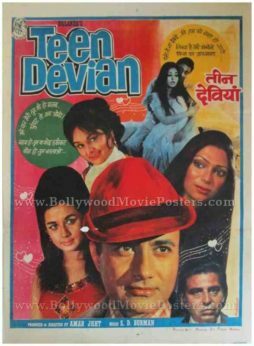 Old Indian movie poster for sale of the classic Hindi film Teen Devian (1965). This is an actual surviving old Indian poster of the 1965 Hindi film that starred Dev Anand, Simi Garewal, Nanda and Kalpana in lead roles. Printed and circulated a few years after the first release of the film (somewhere in the late 1960s / early 1970s), this vintage Indian poster for sale was designed for publicity of the film but never ended up being used. This Indian movie poster for sale was originally designed on a canvas board using a collage of still photographs pasted against a hand painted background. The printed signature of noted Bollywood poster designer Manohar is seen on the bottom right corner of this old Indian film poster. The evergreen star of Bollywood, Dev Anand is seen in a large still photo wearing his trademark hat. His three love interests are seen in smaller photographic stills around him. Hearts entwined in musical notes are seen running across the background of this vintage Indian poster for sale. 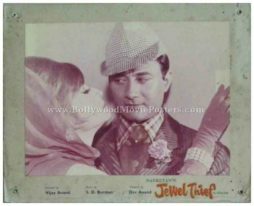 Old Bollywood still photo set of the hit Hindi film, Jewel Thief (1967) for sale. 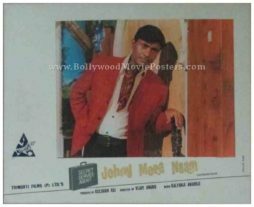 This is an actual surviving set of old Bollywood lobby cards of the 1967 James Bond style spy thriller that featured the evergreen superstar of Indian cinema, Dev Anand in the lead role. Vyjayantimala and Ashok Kumar also played memorable roles in the film. Printed and circulated during the original first release of the film (late 1960s), this set of five Dev Anand old photo stills was printed for publicity of the film inside a cinema hall. Lobby cards were used as pin ups on notice boards inside the foyers of cinema halls. The corners of each of these five lobby cards are punched with ring holes to allow cinemas to pin them up on notice boards with ease. These sepia toned old Dev Anand photo stills were printed and issued to a cinema hall that actually screened the film Jewel Thief. The corners of this old Bollywood lobby card set display visible pin hole markings – tell tale signs of being pinned on the notice board of a movie theater. The film’s soundtrack composed by S. D. Burman includes chartbusters such as “Yeh Dil Na Hota Bechara” and “Hothon Mein Aisi Baat” which are played till today. Old Bollywood still photo set of the hit Hindi film, Johny Mera Naam (1970) for sale. This is an actual surviving set of old Bollywood lobby cards of the 1970 hit Hindi film that starred the evergreen star of Bollywood, Dev Anand in the lead role opposite dream girl Hema Malini. Printed and circulated during the original first release of the film (late 1960s / early 1970s), this set of three Dev Anand old photo stills was printed for publicity of the film inside a cinema hall. 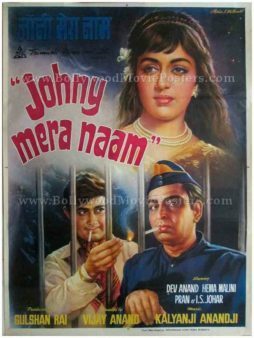 Johny Mera Naam (My Name is Johny) is a 1970 Hindi film starring Dev Anand and Pran in the lead roles as brothers separated during childhood. The film is considered a Dev Anand classic and was the highest grossing Bollywood film of 1970s. The film is remembered till date for its blockbuster song, “Pal Bhar Ke Liye” sung by Kishore Kumar and picturized on Dev Anand and Hema Malini. The song is believed to be used at the end of The Simpsons episode Kiss Kiss, Bang Bangalore in 2006. Black and white old Bollywood still photo set of the hit Hindi film, Tere Ghar Ke Samne (1963) for sale. This is an actual surviving set of old Bollywood lobby cards of the 1963 hit Hindi film that starred the Evergreen star of Bollywood, Dev Anand in the lead role opposite Nutan. Tere Ghar Ke Samne was the last movie to pair Dev Anand and Nutan together, making this set of 20 old Bollywood lobby cards, highly collectible! 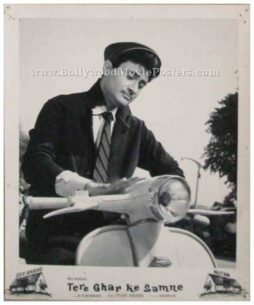 Printed and circulated during the original first release of the film (early 1960s), this complete set of 20 Dev Anand old photo stills was printed for publicity of the film inside a cinema hall. These old black and white Dev Anand photo stills were actually used inside a cinema foyer that screened Tere Ghar Ke Samne! The corners of this old Bollywood lobby card set display visible pin hole markings – tell tale signs of being pinned on the notice board of a movie theater. 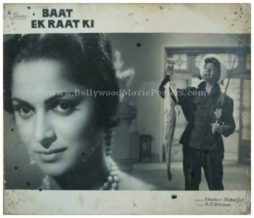 Black and white old Bollywood still photo set of the Hindi film, Baat Ek Raat Ki (1962) for sale. This is an actual surviving set of old Bollywood lobby cards of the 1962 Hindi film that starred the Evergreen star of Bollywood, Dev Anand in the lead role opposite Waheeda Rehman. Printed and circulated during the original first release of the film (early 1960s), this set of four Dev Anand old photo stills was printed for publicity of the film inside a cinema hall. These old black and white Dev Anand photo stills were actually used inside a cinema foyer that screened Baat Ek Raat Ki ! The corners of this old Bollywood lobby card set display visible pin hole markings – tell tale signs of being pinned on the notice board of a movie theater. Old Bollywood movie poster of the Hindi film, Prem Pujari (1970) for sale. This is an actual surviving original vintage Bollywood movie poster of the 1970 Hindi film that was produced and directed by the evergreen superstar of Bollywood, Dev Anand, who also played the lead role in the film opposite Waheeda Rehman. Printed and circulated during the first release run of the film (late 1960s / early 1970s), this old hand painted Bollywood movie poster was originally designed for publicity of the film but never ended up being used. This vintage Bollywood movie poster features stunning hand painted artwork created by one of the most acclaimed Bollywood poster designers of his time, DR Bhosle. A stunning hand painted portrait of actress Waheeda Rehman is seen prominently on the poster. This beautifully hand painted Bollywood poster is set against a dark background of burning flames. Originally hand painted on canvas by master Bollywood poster painter DR Bhosle, this vintage Bollywood poster bears his printed signature on the bottom left. Old hand drawn Bollywood film poster of the hit Hindi movie, Jewel Thief (1967) for sale. This is an actual surviving vintage Bollywood poster of the 1967 James Bond style spy thriller that featured the evergreen superstar of Indian cinema, Dev Anand in the lead role. Vyjayantimala and Ashok Kumar also played memorable roles in the film. 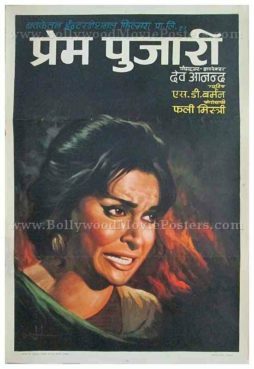 Printed and circulated a few years after the first release of the film (somewhere in the 1970s), this old Bollywood movie poster was printed for publicity of the film but never ended up being used. This vintage Bollywood poster was originally designed on a hand painted canvas by poster artist BR Gulati at an art studio in Delhi, giving it a quirky appearance. A large hand painted portrait of Dev Anand is seen prominently at the center. Ashok Kumar appears in a smaller hand painted avatar at the bottom. Vyjayantimala is seen in a photographic still alongside. 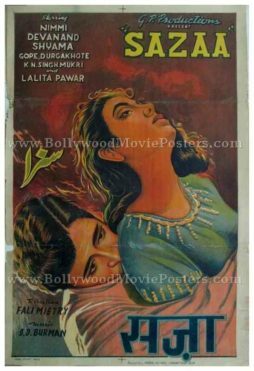 Vintage hand painted Bollywood poster of the black and white Hindi film, Sazaa (1951) for sale. This is an actual surviving original vintage Bollywood poster of the 1951 Hindi film that starred the evergreen superstar of Bollywood, Dev Anand in the lead role. Directed by Fali Mistry, actresses Shyama and Nimmi starred alongside Dev Anand in this love triangle. Printed and circulated during the original first release of the film (early 1950s), this old hand painted Bollywood poster was originally designed for publicity of the film but never ended up being used. This beautifully hand painted Bollywood movie poster features the lead couple of Dev Anand and Nimmi in a passionate embrace. 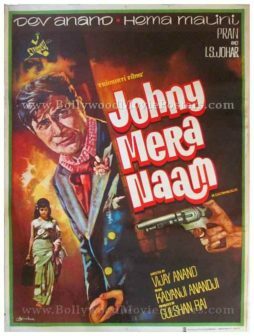 Old hand painted Bollywood poster of the hit Dev Anand film Johny Mera Naam (1970) for sale. This is an actual surviving vintage Bollywood poster of the 1970 Hindi movie that featured the evergreen superstar of Indian cinema, Dev Anand in the lead role opposite dream girl Hema Malini. Printed and circulated somewhere in the 1980s, this old Bollywood movie poster was printed for publicity of the re-release of the film in the 1980s but never ended up being used. 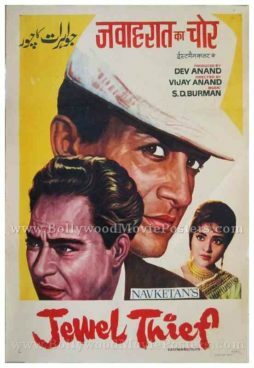 This vintage movie poster was originally designed on a hand painted canvas by the greatest and highest paid Bollywood movie poster artist of all time, Diwakar Karkare. The poster bears the printed signature of Diwakar on the bottom left corner. In his artwork, Bollywood poster painter Diwakar depicts Dev Anand wearing his trademark muffler around his neck. Hema Malini is shown wearing a saree in a much smaller figure on the side. Typography used in this vintage Bollywood poster is completely in English. 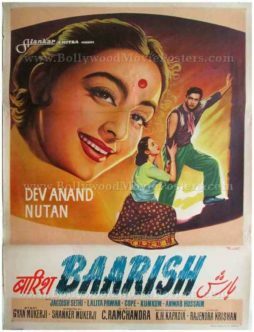 Spectacular vintage hand drawn Bollywood movie poster of the old Hindi film Baarish (1957) for sale. This is an actual surviving old Bollywood poster of the 1957 film that featured Nutan and Dev Anand in lead roles. 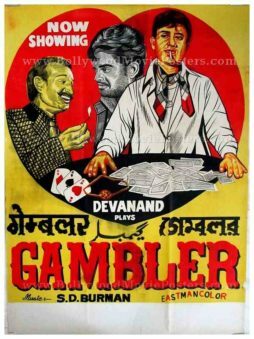 Printed and circulated somewhere during the first release of the film (Late 1950s), this old Hindi movie poster for sale was originally designed for publicity of the film but never ended up being used. This vintage Bollywood poster was originally designed on a hand painted canvas by one of the finest Bollywood movie poster artists of all time, Parchure of Pamart design studio. Parchure’s signature style of mastery can be seen in this superbly hand drawn Bollywood poster, making it highly collectible. Actress Nutan is captured in a brilliant hand drawn rendition in the poster. Bearing a scintillating smile, Nutan appears in a large close up portrait on the top. Smaller figures of the two lead actors are seen alongside – with Dev Anand wearing his trademark muffler. The title of the film uses an interesting typeset comprising fine brush strokes to give it a “rainy” look to reflect the name of the film. Artist Parchure’s original signature appears on the right hand of the poster, signed as “Pamart” – i.e. the name of his art studio. The typography used in this poster is completely in English with the title translated into both Devanagari Hindi as well as Urdu. This old Dev Anand movie poster has been graded as ★ As Is due to visible cracks that have been corrected using taping on the reverse and painting into the cracks. The damage is clearly visible in the photograph – on the center of Nutan’s face. 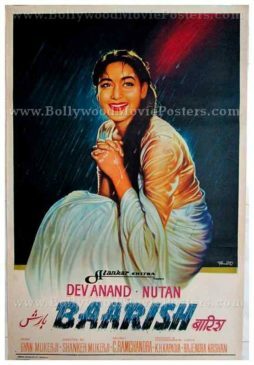 Baarish (Rains) is a 1957 Bollywood movie starring Dev Anand and Nutan in the lead roles. The other cast of the film includes Mehmood, Helen & Lalita Pawar. Nutan appeared in more than 70 Hindi films in a career spanning four decades and is regarded as one of the finest female actors in the history of Hindi cinema. 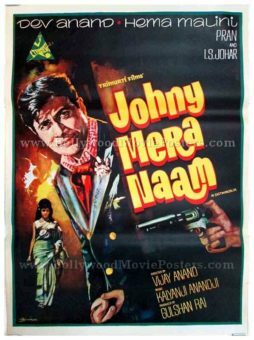 Original vintage hand painted Bollywood poster of the hit Hindi film Johny Mera Naam (1970) for sale. This is an actual surviving old Bollywood poster of the 1970 film that featured the evergreen superstar of Indian cinema, Dev Anand in the lead role opposite dream girl Hema Malini. 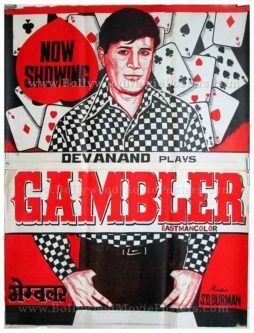 Printed and circulated during the first release of the film (somewhere in the late 1960s / early 1970s), this Dev Anand movie poster was printed for publicity of the film but never ended up being used. This Dev Anand film poster was originally designed on a hand painted canvas by the best portrait artist in India, SM Pandit. The poster bears the printed signature of SM Pandit in the name of his art studio, i.e. “Studio SM Pandit” on the top right hand corner. In this superbly hand painted Bollywood poster, SM Pandit’s flair for realism is strikingly apparent. Dev Anand is seen in a stunningly realistic portrait (wearing his trademark muffler) smoking a cigarette behind bars. Dreamgirl Hema Malini is seen in a beautiful portrait on the top. Comedian I.S. Johar is seen at the bottom dressed as a police constable. Typography used in this vintage Bollywood poster is completely in English. Extremely rare original old Bollywood poster of the hit Guru Dutt production, CID (1956) for sale. This is an actual surviving vintage Bollywood poster of the 1956 hit Hindi film that featured the evergreen star of Bollywood, Dev Anand in the lead role. CID marked the onscreen debut of Waheeda Rehman, making this poster highly collectible. Printed and circulated somewhere in the 1950s, this old Bollywood poster was originally designed for publicity of the film but never ended up being used. This artistic hand painted Bollywood poster features a stunning portrait of Dev Anand on the top – who plays the role of a police investigator in the film. Smaller portraits of Waheeda Rehman, Shakila and Johnny Walker are seen at the bottom. 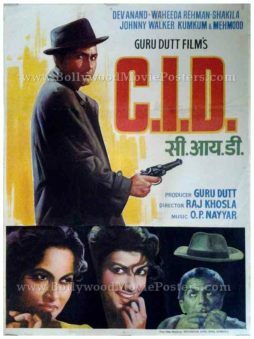 CID is a 1956 old Bollywood film produced by Guru Dutt, starring Dev Anand, Shakila, Johnny Walker, K. N. Singh and Waheeda Rehman. The film was part of a pact between close friends Dev Anand and Guru Dutt who had promised to cast each other as lead actors in films they would direct. The film is remembered till date for actress Waheeda Rehman’s debut – marking her successful entry into Bollywood. Spectacular hand painted vintage Bollywood movie poster of the old Hindi film Baarish (1957) for sale. This is an actual surviving vintage poster of the 1957 film that featured Nutan and Dev Anand in lead roles. Printed and circulated somewhere during the first release of the film (Late 1950s), this vintage movie poster was originally designed for publicity of the film but never ended up being used. This poster was originally designed on a hand painted canvas by one of the finest Bollywood movie poster artists of all time, Parchure of Pamart design studio. Parchure’s signature style of mastery can be seen in this superbly hand painted poster, making it highly collectible. Actress Nutan is captured in a brilliant hand painted rendition in the poster. Bearing an innocent smile, Nutan appears in a sensuous avatar wearing a saree drenched in the rains. The title of the film uses an interesting typeset comprising fine brush strokes to give it a “rainy” look to reflect the name of the film. Hand painted old quirky vintage Bollywood poster of the cult Hindi film Guide (1965) for sale. This is an actual surviving vintage poster of the 1965 film that featured the evergreen superstar of Indian cinema, Dev Anand in the lead role opposite Waheeda Rehman. Guide is the first film in the history of Indian cinema to sweep the Filmfare Awards by wining all major award categories (Best Movie, Best Director, Best Actor and Best Actress). Printed and circulated several years after the first release of the film (somewhere in the 1970s), this movie poster was printed for publicity of the re-release of the film in the 1970s but never ended up being used. This poster was originally designed on a hand painted canvas by a small time art studio in Kolkata, giving it a very quirky appearance and making it very collectible. 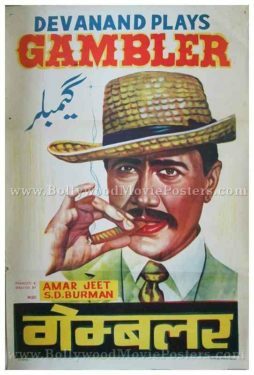 In the poster, the artist depicts Dev Anand wearing his trademark hat. Typography used in the poster is completely in English and the film’s title has been given prominence. 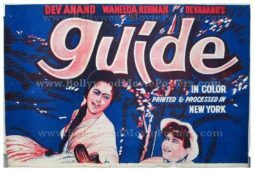 Guide is a 1965 cult Hindi film starring Dev Anand and Waheeda Rehman in lead roles. The film is an adaptation of the critically acclaimed novel, The Guide, by R. K. Narayan and is widely considered to be one of the finest masterpieces of Indian cinema. Guide was initially planned to be an Indo-American co-production – to be shot simultaneously in Hindi and English. The lead actress Waheeda Rehman was reportedly even tutored on her diction of English in preparation for the same. The music for this film was composed by ace music composer Sachin Dev Burman. Songs of the film went on to become the biggest blockbusters of the decade and find place among the greatest soundtracks ever made in Indian cinema till today. “Aaj Phir Jeene Ki Tamanna Hai” and “Piya Tose Naina Laage Re” sung by Lata Mangeshkar went on to become a rage throughout the nation. “Gaata Rahe Mera Dil” sung by Kishore Kumar is a timeless classic and continues to be played till today. A shortened 120-minute US version of the film was screened at the 2007 Cannes Film Festival, 42 years after the original release of Guide. Hand drawn vintage Bollywood poster of the hit Hindi film Johny Mera Naam (1970) for sale. This is an actual surviving vintage poster of the 1970 film that featured the evergreen superstar of Indian cinema, Dev Anand in the lead role opposite dream girl Hema Malini. Printed and circulated several years after the first release of the film (somewhere in the 1980s), this movie poster was printed for publicity of the re-release of the film in the 1980s but never ended up being used. This poster was originally designed on a hand painted canvas by the greatest and highest paid Bollywood movie poster artist of all time, Diwakar Karkare. The poster bears the printed signature of Diwakar on the bottom left corner.